Click the downloads to view the toplines and crosstabs and scroll down to read the analysis. Americans are anxious. Many no longer believe they and their children have a real shot at earning a good life. Fifty-one percent say it will get even harder in the future—30 points more than the number who say it will get easier. The culprit? A rapidly changing economy that has left people unsure about their place in the Digital Age and even less certain of where they will fit in the years to come. 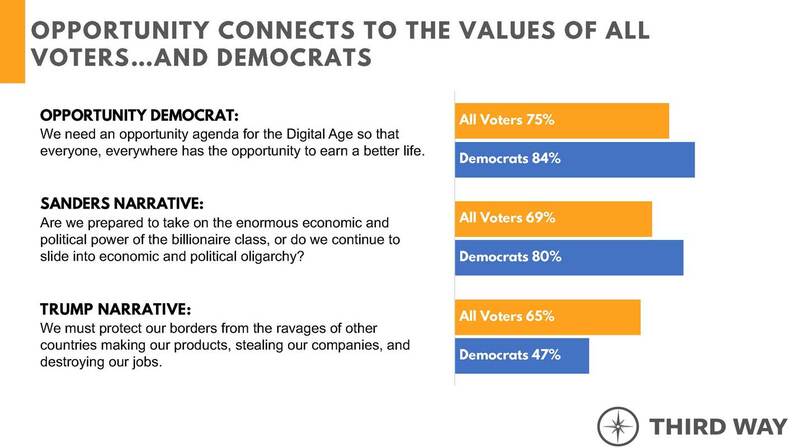 To confront this anxiety, Democrats need to offer a new social contract for the Digital Age: bold new ideas that will provide every American everywhere a real opportunity to earn a good life. Since the 2016 election, the Democratic Party has engaged in a debate over the best ideas to move the country forward and defeat Donald Trump. In the echo-chamber of social media, a conventional wisdom has developed that Bernie Sanders-style ideas are ascendant—particularly with the voters that make up a winning Democratic coalition. But new data shows that a narrative and agenda focused on expanding opportunity is both more popular with Democratic voters than a Sanders-style approach and significantly more likely to help Democrats beat Trump in 2020. We believe an opportunity approach is a better path forward than alternatives on the table both from the right and the far left because of three realities: it reflects voters’ lived experience, it aligns with enduring American values, and it substantively addresses the on-the-ground challenges of the changing economy with new, future-oriented ideas—not recycled solutions better fitted for past eras. And the results of a poll conducted by David Binder Research of 1,200 likely 2018 voters show unequivocally that an opportunity narrative and agenda is Democrats’ best shot at coalescing the Democratic base and winning over the voters in the middle needed to defeat Trump in 2020. Voters believe our biggest economic problem is an opportunity crisis. When asked about their own personal economic circumstances, voters say they are struggling today and life is getting harder: 55% say earning a good life is hard to achieve right now, by a two-to-one margin they say it is harder than in the past, and a majority expects it will get harder still in the future. And voters say a changing economy is creating this anxiety: 52% of voters, including 63% of Democrats and 54% of Independents, say changes in the economy limit their opportunity to earn a better life. Looking to the next generation, voters say there will be less opportunity for a 17-year-old in their local high school in their area by a 7 point margin. This margin jumps to 31 points with Democrats and 20 points with Independents. And by a 24 point margin, voters say young people would find more opportunity if they moved away from their local community. In small towns and rural areas, this margin explodes to 47 and 44 points. By a 20 point margin, voters want government to focus on policies that spread opportunity to more people and places over addressing income inequality. Voters believe expanding access to opportunity is the antidote to the economic challenges they face. By a 20 point margin, they want government to focus on policies that spread opportunity to more people and places over addressing income inequality. This preference for opportunity is consistent across all the key groups that are part of a winning Democratic coalition. Opportunity wins by 17 points among voters of color, and that margin expands to 23 points with Millennials and 26 points among union households. One reason why voters gravitate to a narrative that emphasizes the opportunity to earn a good life is that it is the only one on the table that taps into the enduring American value of hard work. In contrast to other advanced economies, Americans uniquely value earning their way; in our poll, 81% said hard work is important to getting ahead in life. Opportunity is what Americans want, and earn is what they value. So it’s no wonder that a description of our economic problems focused around opportunity beat out both Trump- and Sanders-style problem statements with voters. And counter to the prevailing wisdom, the opportunity narrative garnered slightly more support even among Democrats than a direct quote from Senator Sanders. Voters say an Opportunity Agenda would improve their communities. Support for an Opportunity Agenda was not just broad but deep, with the solutions appealing to the very voters Democrats need to win in both primary elections and the general. 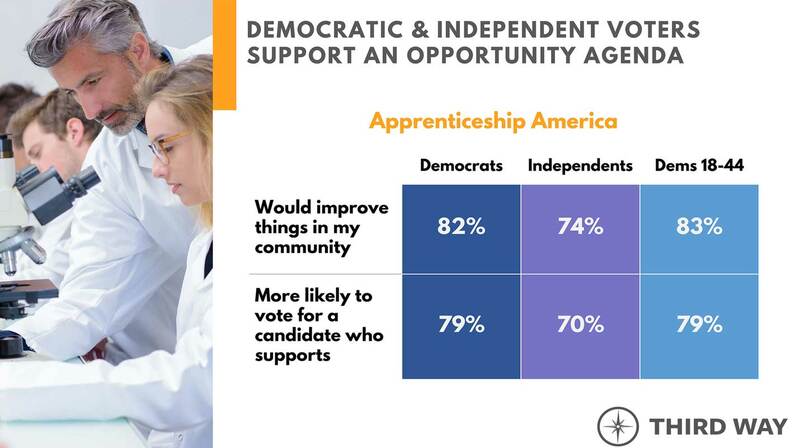 Digging into one example, a national apprenticeship program called Apprenticeship America, more than 80% of Democrats say it would improve things in their communities and three-in-four Independents say the same. 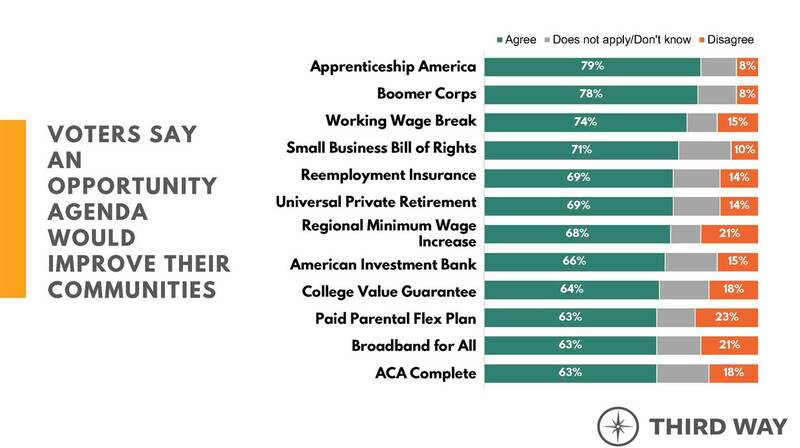 Similar shares of each group also say they would vote for a candidate that backed the Apprenticeship America proposal. And among young Democrats who need to be energized for the Party to win in 2018 and 2020, the proposal is equally popular. Voters prefer an Opportunity Agenda to both Trump- & Sanders-style approaches. Recently, there has been a raft of polls showing support for some of the items in a Sanders-style agenda, like single-payer health care. But that research has tested ideas in a vacuum rather than in a competitive setting against policy alternatives. In our survey, we first presented voters with our proposals to three enduring challenges (jobs, wages, and health care), but then we tested them against Trump- and Sanders-style approaches in a head-to-head format. On all three counts, both a national sample of voters and voters in the Democratic coalition prefer the opportunity-focused approach. The Opportunity Agenda's regional minimum wage policy has more than three times the support as a nationwide $15 minimum wage, and Democrats prefer it by a margin of 31 points. 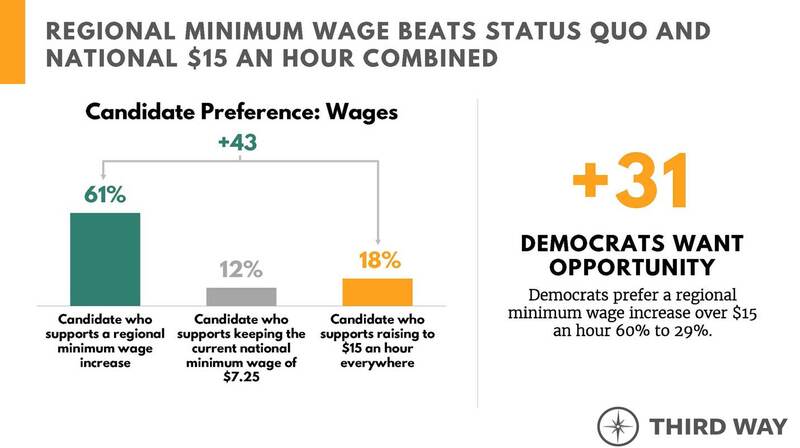 For example, we tested a regional minimum wage increase based on the cost of living against a Sanders-style national $15 an hour minimum wage and the Republican status quo approach. A regional minimum wage beat out the other two alternatives combined. The Opportunity Agenda policy has more than three times the support as a nationwide $15 minimum wage, and Democrats prefer it by a margin of 31 points. Looking at constituencies within the Democratic Party, Democratic women prefer the regional minimum wage by 26 points, voters of color by 38 points, and Millennials by 38 points as well. On the other two enduring challenges, jobs and health care, voters also prefer the Opportunity Agenda. On jobs, voters pick a public-private approach over a federal jobs guarantee by 30 points, and among Democrats, this margin increases to 35 points. On health care, voters choose completing the work of the ACA over national single-payer health care by seven points, and among Democrats, this margin jumps to nine points. An Opportunity Democrat can appeal to Democratic voters in the primary—and win over the general electorate. In 2020, Democratic presidential candidates must present a narrative and agenda that can accomplish two things in order to beat Trump: coalesce Democrats in the primary and then win over swing voters in the general election. 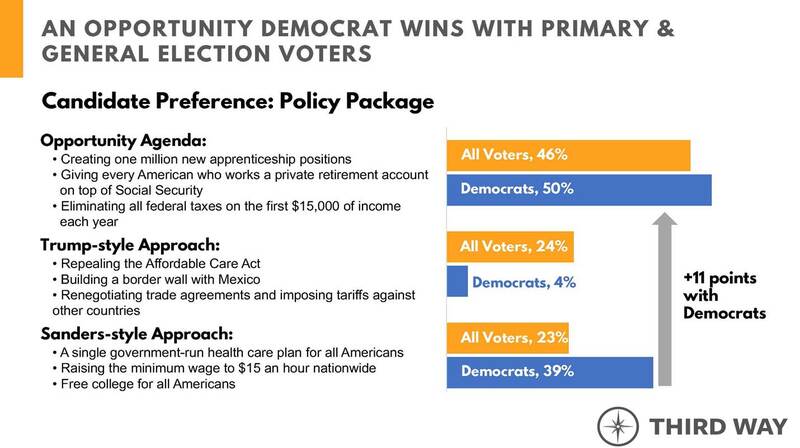 So we presented voters with a package of Opportunity Agenda proposals as well as Trump- and Sanders-style platforms to see which fared best at these twin goals. In this three-way test, support for an Opportunity Agenda dwarfs the alternatives, and among Democrats, it’s a double-digit winner. Among the overall electorate, opportunity beats out both the Trump- and Sanders-style platforms by more than 20 points, while Democratic voters prefer it over the other Democratic approach on the table 50% to 39%. The first challenge for Democratic presidential aspirants will obviously be coalescing support with primary voters, and the data could not be clearer that an Opportunity Agenda has strong support with key Democratic constituencies. When it is put up against Sanders’ agenda, Democratic women prefer it by 11 points, voters of color by 10 points, and Millennials by 13 points. Voters who say they would not vote for Trump in 2020 favor it by 18 points. And while winning the primary will obviously be their first focus, ultimately the Democratic nominee must defeat Trump, and the swing voters that will help realize this goal overwhelmingly support the Opportunity Agenda. Independent voters, which in this survey sample evenly split their vote between Clinton and Trump in 2016, prefer an opportunity platform over a Sanders-style agenda by 40 points. And when compared to Trump’s agenda, Independents pick opportunity by 34 points. The data is clear that changes taking place in the economy have left voters feeling that they no longer have the opportunity to earn a better life. To remedy this, they are looking for ideas that will expand access to opportunity to everyone, everywhere. Nationwide voters, Democrats, and key constituencies like Democratic women, voters of color, and Millennials prefer an Opportunity Agenda to address the enduring challenges of jobs, wages, and health care over Trump- and Sanders-style approaches. And when comparing the overall platform against these two alternatives, the Opportunity Agenda is the only one that can deliver both primary voters and the general electorate. To restore voters’ faith that it is possible to earn a better life in America, Democrats must become the party that is known for wanting to expand opportunity to everyone and everywhere and offer concrete, future-oriented, bold ideas to deliver on that promise. Armed with an opportunity narrative and agenda, they can defeat Trump in two years and win back key seats up and down the ballot.